LESSON 1: Who Lives at the Poles? LESSON 2: How Will You Show You Care? LESSON 3: Here a Floe, There a Floe, Everywhere an Ice Floe. LESSON 4: What do you Know? LESSON 6: What do we Have in Common? LESSON 7: How Do You Survive? LESSON 10: How do You Build an Igloo? Students will be able to identify similarities and differences between two texts on the same topic. Students use a Venn diagram to compare and contrast the two Polar Habitats. When all of the students are seated on their dot in the rug area I hold up the book we read the previous day. 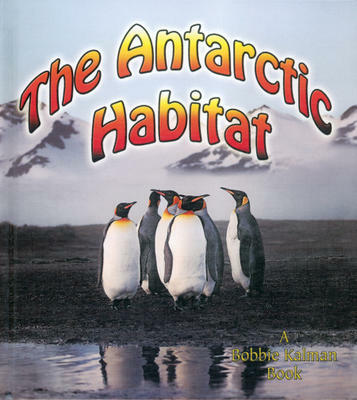 The Antarctic Habitat, by Molly Aloian and Bobbie Kalman. I select several students who are following the correct student protocol of raising their hand to respond to this question. I use this discussion to refresh the students’ memories of facts they know about the Antarctic. They will need this information in order to complete the activity part of the lesson. I open the book to the first page and we discuss how we see a table of contents. I point to someone who is raising their hand. I point to another student. I select enough students to respond to this question until we have reviewed all of the features of a non-fiction book. Features such as: pop-out words (bold words), index, and glossary and perhaps labels. Any features that were missed by the students I will bring up during this discussion. During reading will discuss some of the features we come across that are in direct contrast to yesterday’s book. Features such as it is a water based pole surrounded by land, native people are associated with this area and polar bears roam wild there but no penguins. After reading I tell the students to take a seat around the edge of the rug. While the students are moving to the edge of the rug I open up a blank screen on the SMARTBoard. Once everyone is settled I draw a Venn diagram on the blank screen. I select a student with their hand raised. Again I select a student with their hand raised. “Great Ryan; I use the Venn diagram to put information in about two things.” At this point I review what Ryan said in the correct terminology so the students get comfortable with the correct terminology and have a deeper understanding for when they asked to recall this tool with another teacher. I select a student who has their hand raised. I select several students to give me information from both books and we decide whole group where the information goes. I make sure to have at least two or three pieces of information for each section. After we have filled in the Venn diagram with some information I tell the students what they are going to do at integrated work time. I select enough students with their hands raised to cover all the resources the students can use. “Table number one let’s go have some Arctic Antarctic fun. Students preparing to sort Arctic and Antarctic images. Labeling ready for sorting. Labeling using resources. Student working on labeling images. Student sample of image sorting work. Student showing Arctic Antarctic sort of images. Once the students are seated I tell them their exit slip for today is to tell me one detail they recall from our lesson today. After a student has told me the detail they recall they are able to use the hand sanitizer and go to get their snack. If a student is unable to give me an answer, they know they can do one of two things. They can wait until everyone else has gone and then we will work together on coming up with a detail. This exit ticket process can be used as a quick assessment tool to see if students grasped the concept in the lesson activity. For this assignment I will use the Arctic Antarctic Compare and Contrast Activity Checklist to go over the students work to make sure they met the objectives set for the assignment. Once I have completed the checklist, I attach it to the students work and place it in their collection portfolio. Looking at the student’s work with the checklist helps me to stay focused on the objectives of the lesson. I am looking to see if the student is able to accurately follow the directions for the assignment which means they will meet the overall objective for the lesson. Did the student write their name on their work? Did the student accurately fill in the information on the Venn diagram? Did the student sort the items correctly to each pole? Is the students work neat and tidy? Using checklists helps me to stay focused on what I am looking for in the student work and maintain a fair view of each student abilities. The checklists are also a good way to convey information to the student’s parents about how they are doing in the classroom during work time. Students practice their magnifying glass skills by matching a tiny Polar image to the correct large Polar image.